Note: This page contains only background and educational information on these early style P1800 Smiths Clocks. If you don't want to read this information and only want to find out about our services and products related to these clocks then click on the arrow button (above) to go to Page 2. What's up with these dash clocks on the '61 - '69 1800s that NEVER seem to work ? To find one of these clocks in working order is, to say the least, exceedingly rare. This is because they suffered from a design flaw that caused 99.99999% of them to die a very premature death. Inside the clock there's a pair of tiny and delicate electrical contacts that were almost 100% prone to burning because there was too much current going through them. These contacts typically failed within a couple years of the clock being put into use thus causing almost every one of these clocks to die an untimely and premature death. This is why you can never find one that actually works unless it's been worked on or has had the guts replaced by a quartz clock or something. The good news is that once this flaw is corrected and the problem points repaired, these beautiful and charming 4 jeweled brass reminders of a bygone era will run very reliably and for a long time because the actual workings of the clock are almost always in near new condition owing to the fact that the problematic contacts caused the clocks to malfunction and fail long before they suffered any mechanical wear. What can be done to overcome this design flaw ? We at Volvosolutions.com have a very unique solution to this problem. Not only do we repair the faulty contacts, clean and lubricate the workings, we also install an ingenious small solid state circuit (designed by an experienced Electrical Engineer) within the clock to prevent those contacts from failing prematurely again (see photo on right). It does this by reducing the amount of current going through those contacts by an impressive 99.5%. In other words, after this little extra circuit has been installed, the current going through the delicate contacts is reduced to a mere 1/200th of the original amount. The extra circuit also acts as a noise filter by "smoothing" out the electrical impulses within the clock's electrical system making it run better and less prone to stalling. This extra circuit will thereby ensure that this clock will run for much longer and much more reliably over the long haul than one repaired by someone else or even an brand new NOS one, if you could ever find such a thing. 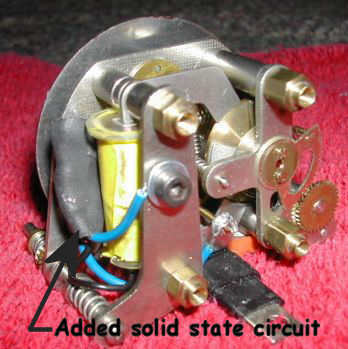 Note: The extra solid-state circuit is shown in the right hand photo at the top of this page. It is within the black heat shrink protective sheath on the left side of the clock. It has two blue wires and one black one going into it. What else do you do to the clocks when you repair/refurbish them ? Besides cleaning, lubricating and adding the special solid state circuit to make them run reliably and last a long time we also clean and polish up the chrome bezels and clear plastic lenses. 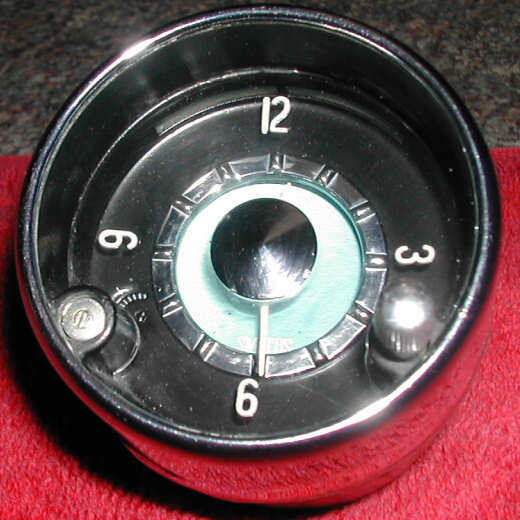 We use a number of specialized products which make the chrome look shiney and new and removes most scratches and hazing from the clear plastic clock faces. The result is a great looking dash clock with a sparkling chrome bezel and a clear and nice-looking lens just like the one in the above left picture. Those chrome bezels are hard to remove from those clocks without making a real mess of them. How do the clocks look after you've opened them up to repair them ? Through a considerable amount of research we have developed our own specialized tools and techniques that enable us to remove and re-crimp the delicate chrome bezels on these clocks without doing any noticeable damage to them. From what we've seen, most instrument shops do a lot of damage to those bezels trying to get them off because they either don't know how to do it properly or can't be bothered to spend the kind of time it takes to remove and replace them without creasing or cracking them. Do you sell refurbished units or do you just repair & refurbish clocks for your customers ? We can only repair/refurbish clocks provided by our customers. We used to offer refurbished units but the cost of obtaining decent used non-working clocks has gone way up to the point where it's no longer feasible for us to continue offering refurbished units. If you would like to get a refurbished unit we will tell you where you can obtain a nice looking non-working used one you can send to us for repair. What kind of testing and quality control procedures do you do on the clocks before you call them good and send them out ? Each clock we work on will have been bench tested 3 separate times during the repair process. We first do a 24 hour bench test right after we've cleaned and lubricated the clock and added the special solid state circuit to it. If the clock doesn't run continuously for the entire 24 hour test period it is looked at again, repaired as necessary and given another 24 hour bench test. Once it passes the 24 hour bench test we reassemble the clock without re-crimping the bezel and test it again for at least 6 hours (it's often more like 12 hours) to make sure it's still running perfectly. If it fails to pass the test, the clock is taken apart and fixed again and put through the entire testing procedure again from the beginning. Once it has passed the first and second tests without once stalling we then re-crimp the bezel and test it again for a minimum of 4 hours. The clock must pass this final test on the first try or it gets taken apart, fixed and put through the entire testing procedure again. Only after the clock has passed all three tests will we send it back or sell it to a customer. In truth, 99.9% of the clocks we repair or sell pass all three tests the first time through. We don't take that for granted, however, and that's why we have such rigorous quality control and testing procedures. Why should anyone go to this amount of trouble to restore one of these old clocks when one can just as easily replace the guts with a modern quartz movement that keeps better time ? Well, why does one restore and drive an old P1800 when they can drive a new sports car that's much more reliable ? Why bother trying to keep anything original on a classic car ? There are lots of different reasons one might have for driving an 1800 rather than a new sports car and for keeping it as original as possible. One of those reasons would be to preserve a little bit of automotive history. Another would be because our old 1800s have a lot of charm and character and that needs to be preserved and kept alive. It's the exact same thing with these clocks. Inside the early style ('61-'69) Smiths clocks in the 1800 is a beautiful 4 jeweled old-school hand-made electro-mechanical brass movement made up of hundreds of tiny parts. The guts are almost completely made of brass and steel and hardly any plastic is used. Nobody makes clocks like that anymore, especially car clocks. As such, they're a little piece of automotive history and a relic of a bygone era all within themselves. They're a big part of what makes our 1800s so charming and classy. What a shame and loss it would be to gut out one of these beautiful clocks and replace the innards with a cheap mass produced two -dollar Chinese made quartz movement ! Call us purists but we here at VolvoSolutions.com believe the proper way to show respect for the people who designed and made our cars and to preserve the history within them is to restore those clocks and keep them original. We only add a tiny electrical circuit to these clocks to correct their one fatal design flaw and the rest of these charming instruments is kept 100% original. That, we believe, is the right thing to do.